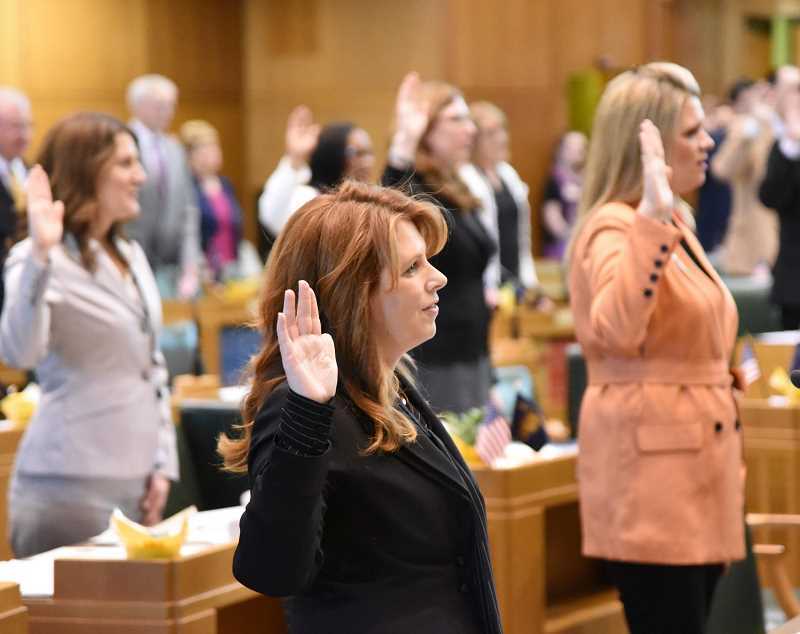 Two recently elected women have officially begun their first term representing Wilsonville on the Oregon State Legislature. 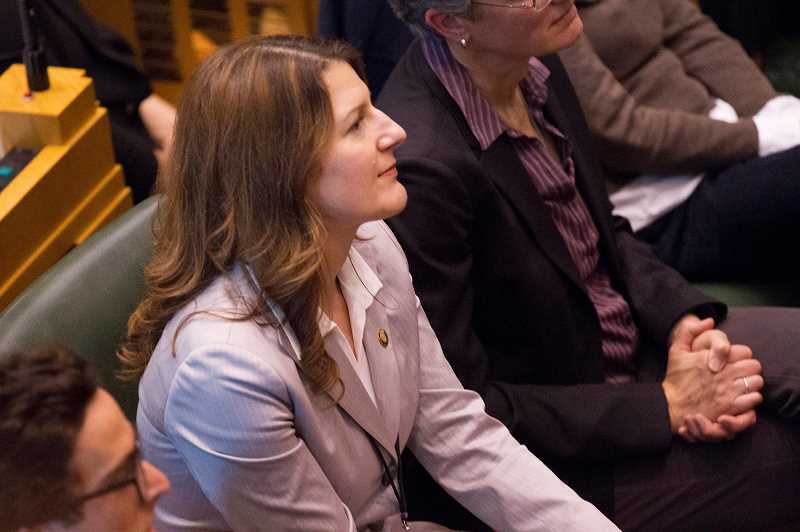 House District 26 representative Courtney Neron (D-Wilsonville) and House District 39 (Charbonneau) representative Christine Drazan (R-Canby) were sworn in Monday, Jan. 14 and began formulating potential legislation, preparing for committee work and meeting fellow legislators. The Spokesman caught up with both last week and learned about their plans for the legislative session. 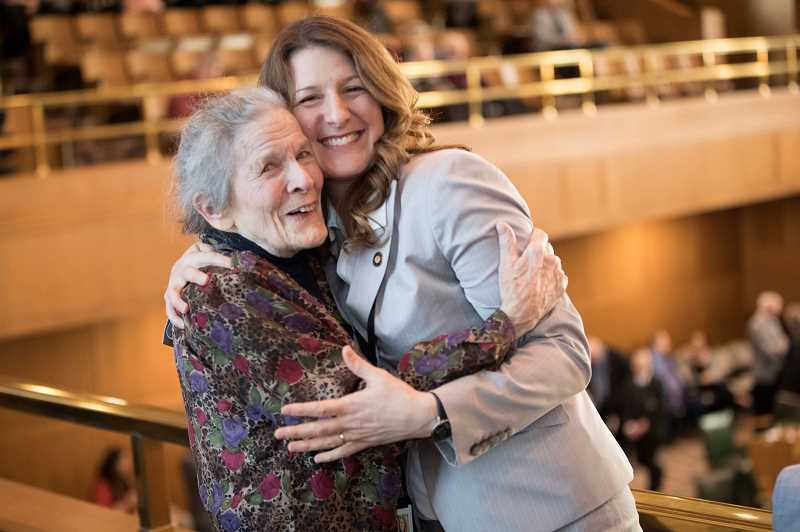 Neron said her first day in Salem — where she was sworn into the Legislature in front of friends, family and even her second-grade teacher, escorted House Speaker Tina Kotek (D-Portland) during the ceremony and met "an amazing group of representatives" in her caucus — was a special day. "I was so honored that my family and many people who supported me through the campaign were there," she said. However, with long training sessions, prep work, organizing staff and evening events filling up her schedule, she had hardly a moment to reflect on the experience. Plus, throughout the week, potential bills and committee assignments were on her mind. For one, Neron is considering putting forward legislation that would reimburse child care expenses for candidates running for office. "It's something that surprised me when I ran for office," Neron said. "I had to be really strategic not only with money for paying a babysitter but with the times that I would door knock." She is also looking into legislation that would provide employment protection for victims of domestic violence. "Victims are much more likely to lose their job after incidents of assault or violence and therefore making them more dependent on their abuser," Neron said. As for her primary focuses, Neron — formerly a teacher — was appointed to the Education Committee, the Natural Resources Ways and Means Committee and the Veterans and Emergency Preparedness Committee. Neron said she will support bills that bolster education funding and that she will submit a proposal that would allow dual credit courses (college level classes taught to high school students) to apply to a wider variety of institutions. She might also introduce a proposal to provide more resources to teachers who want to teach dual credit classes. "We feel that it is our time to enact really important education legislation that will stabilize funding for schools. In the last nearly 30 years since Measure 5 (which led to funding for schools to be distributed at the state level rather than the local level) the state hasn't adequately funded education," Neron said. Neron would also like to amend the state's list of chemicals that can be used on school facilities. She said the list includes harmful pesticides and that school districts are often wary to deviate from the list and, in turn, potentially expose themselves to litigation. "I would like to see our state's list of chemicals for schools include safer, less toxic options," she said. Neron also said the Democratic caucus is working on legislation related to housing affordability, greenhouse gas emissions and health care. As a new representative, she's trying to soak up as much information as she can. "There's so much to learn," she said. "You have to learn a little bit about everything and a lot about some things." Neron said legislators in her caucus seemed compassionate, intelligent and authentic. "One thing that's really powerful is how prepared Oregon is to have a citizen legislature," she said. "We have real people representing real people." Drazan enjoyed being sworn into the Legislature and mingling with Republicans and Democrats alike during her first day as an official state representative. "The whole experience being on the floor with people from across the state and just recognizing we are all there to serve the folks who elected us and try to do our best to make Oregon stronger at the end of the session is very humbling," she said. Although she might differ politically from Democratic legislators, who control the State Senate and House of Representatives, Drazen— previously director of a cultural nonprofit — said she will try to find common ground and solve issues affecting the community. Her committee assignments include the Education Ways and Means Committee, the Economic Development Committee and the Health Care Committee. "To me those are not partisan issues. Those are issues that affect all Oregonians," she said. "I believe there will be a lot of opportunity to come together to improve patient experience, education and job growth. I'm optimistic there will be opportunities to really make progress." In the schools' sphere, Drazan would like to bolster funding for education, reduce the draining affect that the Public Employees Retirement System has had on school budgets, improve mental health services for students and bolster support for career and technical education. "I think those are really important right now for our students to be successful in the classroom," Drazan said. Improving prescription drug pricing transparency, she said, will also be a priority. "There will be proposals related to transparency and allowing policy makers as well as patients to have a better sense of how the money flows through the healthcare system and making sure patients can feel confident that the drug prices they are paying at the pharmacy are the best prices for them and they aren't paying more than they have to," she said. Regarding economic development, Drazan would like to see greater economic activity and more jobs in her district and believes improving the transportation system could help that cause. "I think it's tied in directly to transportation. We have to have well-kept roads, support the expansion of the Sunrise Corridor, relieve congestion and we have to connect communities to transportation routes to allow industry to continue to grow in places that are not just Portland but other parts of the state," she said. After being sworn in, Drazan spent the rest of the week in training sessions, organizing her office and meeting colleagues. According to her, the recent Bureau of Labor and Industries report that outlined the Legislature's negligent response to sexual harassment allegations was a central topic of conversation. "The Legislature has to hold itself to the highest standard. We have to hold ourselves accountable. We are doing the people's work and this is the people's building. Behavior in this building has to be exemplary," she said. "It's really important we resolve these issues and improve the culture around the capital in a way that is lasting and show folks we aren't going to stand for this behavior anymore."